Get creative with this unique heirloom Family Name Rosary using up to 5 individual names or your Last Name and your choice of multiple color options! Create a unique heirloom Family Name Rosary using up to 5 individual names or your Last Name (up to 10 letters each)! Created with 6mm Swarovski crystals and .925 sterling silver components. Personalization (up to 10 letters/spaces per decade) = $3.50 per letter. Get creative! Create this gorgeous keepsake rosary in just one Swarovski birthstone colored crystal, or maybe you want a multi-colored rosary?! (ie, each individual's birthstone color on their decade!). 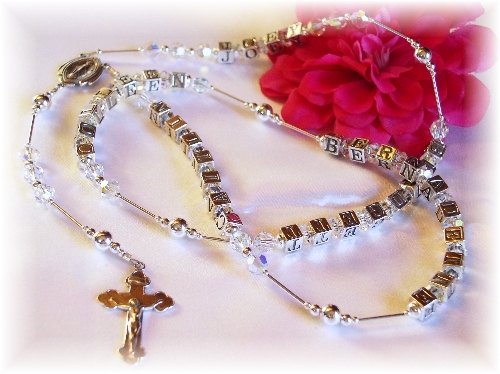 * Swarovski rosaries not intended for use by children under 13.